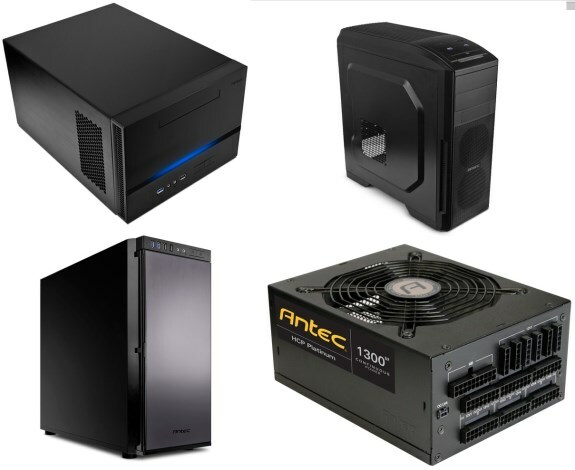 Antec previews the new products it will present at next month's CeBIT. It includes a couple of new power supplies, new cases and a new line of all-in-one liquid coolers. In the year of their 28th anniversary, Antec Inc., leading provider of high-performance computer components and accessories for the gaming, PC upgrade and Do-It-Yourself market, present numerous innovations in the course of this year's CeBIT exhibition in Hanover, Germany. From 10th to 14th March 2014, Antec' new products will be showcased at booth D21 in Hall 15 at the joint stand with Pilot Computer. Among the novelties are the latest models from the Performance One and Gaming series of Chassis, the innovative, in-house designed Antec CPU-H2O coolers, the new High Current Pro power supplies and the brand new EDGE PSU range. The new Antec EDGE PSU series provides stable output voltages and efficient and reliable system performance. The fully modular power supplies are Haswell-ready, compatible with the new ATX12V 2.4 standard and they are covered with five years of warranty. The models EDGE 550, EDGE 650, EDG 750E and EDG-850 deliver 550 watts, 650 watts, 750 watts and 850 watts of continuous Power. All models are 80 PLUS Gold certified and achieve an efficiency of up to 92 percent. High-performance Japanese capacitors provide a stable DC output and safe regulations. Sufficient PCI Express port connectors and a 13.5cm fan with white LEDs make EDGE the ideal PSU for high-end gamers and enthusiasts. Antec's High Current Pro Platinum Series is fully modular with a revolutionary 20 +8 pin MBU socket for the challenges of the future. By using an 80 PLUS PLATINUM and ErP Lot 6: 2013 certified model, users can reduce their electricity bill by up to 25 percent. The innovative 16-pin socket allows for more flexibility by doubling the modular connection options with different 8-pin plugs and possible future plugs with 10, 12, 14 or 16-pin. At CeBIT, the 850W and the 1300W models will be on display. With the power supplies of the True Power Classic series, Antec presents gold-certified models with 550 watts, 650 watts or 750 watts. All models are equipped with whisper-quiet double ball-bearing fans with thermal Manager to control heat and noise generation. Two High Current +12 V rails with high maximum load ranges for the CPU, VGA card compatibility and multi PCI-E connectors for multiple GPU support make the TruePower Classic power supplies a good and inexpensive option. Like all other Antec PSU series, the True Power Classic PSUs are equipped with Circuit Shield fuses boasting industrial quality. Antec's case novelties include the ISK600, the Nineteen Hundred , the GX500 and the P100. The ISK600 is a compact and robust Mini-ITX case. The frame has a height of 19.5cm, a width of 26cm and a depth of 36.9cm. The chassis is made of 0.8mm cold-rolled steel and the brushed aluminum of the single piece side and top panel ensure an elegant finish. The concept behind the ISK600 fits the requirements of conventional PCs , but is also aimed at professional users and system providers looking for solutions with a small format. The case offers space for graphics cards up to 12.5" length ( a total of two expansion slots ) , CPU cooler with a maximum height of 17cm and six drive bays ( three 3.5 " and two 2.5 "bays and one bay for a slim optical drive). A whisper-quiet 120mm FDB fan ensures sufficient cooling. Additional flexibility is provided by a USB 2.0 port, a USB 3.0 port and audio input and output . The ISK600 is suitable for a variety of purposes - from small desktop , compact gaming right through to a home theater PC . The P100 is a successful blend of stylish design with a sophisticated cooling system, and the proven Quiet Computing features from Antec's award-winning Performance One case series. Like all models in the series, the P100 is equipped with additional features to enable Quiet Computing , so that the system is almost inaudible even if the fans are spinning at a higher speed . The double-layered side panels as well as the front door made of steel and foam reduce system noise to a minimum. The double -hinged front door opens up to 270 degrees, which allows easy access to external components. The case is compatible with standard ATX motherboards. On the front are ergonomically well-placed two USB 3.0, two USB 2.0 ports and audio jacks. In addition to seven expansion slots, the case also features two toolless 5.25" and seven tool-free 3.5" / 2.5" drive bays. With the GX500, Antec presents a solid entry-level gaming case. The GX500 already comes with three pre-installed 120mm fans, three additional 120mm fans can be installed. Two three-stage fan controllers at the top provide a balance between high performance and quiet operation. Two USB 3.0 ports and audio inputs and outputs are easily accessible at the top. A total of eight drive bays and space for seven expansion cards are available. The Nineteen Hundred is a perfect combination of cooling, performance and comfort coupled with a stylish, functional appearance. The efficient cooling system of the case consists of three 120mm Fluid Dynamic Bearing (FDB ) intake fan in the front, two 120mm FDB exhaust fan on the top and a 120mm exhaust fan at the rear of the chassis. Two additional 120mm HDD fan mounts provide options for additional cooling of the CPU and graphics card. The Nineteen Hundred comes up with 17 drive bays. Nine expansion slots with enough space for graphics cards with a maximum length of 330mm (13.0 inches) cater for extra flexibility. The frame has a height of 69.6cm, a width of 22.3cm and a depth of 55.5cm. The robust chassis is made of 0.8mm cold-rolled steel. The double mesh structure allows for a perfect air circulation inside the case. The double-layered sidewalls and the preinstalled silicone grommets of Nineteen Hundred reduce system noise to a minimum. On the front panel, a colored frame provides stylish accents. With the all-in-one liquid cooling of H2O series, Antec presents the next generation of easy to install and completely maintenance-free CPU coolers. There are currently three models available, the H20 650, 950 and 1250. All models are equipped with high-quality copper cooling plates with excellent heat transfer properties and an extra-large built-in radiator pump for efficient transport of fluid through the heat sink. The integrated PWM fans adjust the speed depending on the temperature. The H2O coolers ensure Quiet Computing features with an excellent price-performance ratio.